I am delighted to be representing the United Kingdom in this important and timely debate. 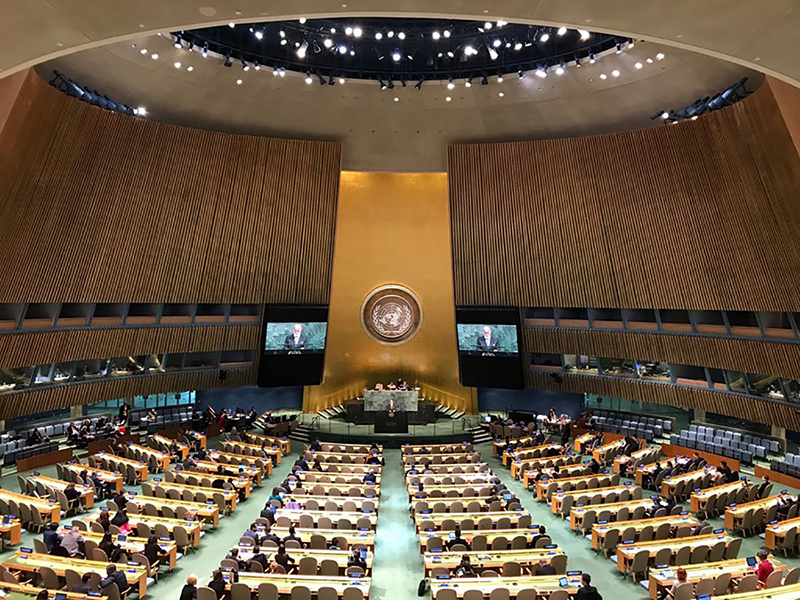 I am very grateful to the British Government for the opportunity to address the General Assembly on road safety which for many years has been a strong concern of mine. Already in this twenty first century more than twenty million people have been killed, and many millions more seriously injured in road crashes around the world. According to the World Health Organisation, every day 3,500 lives are lost in road crashes that are predictable and preventable. This is far too heavy a price to pay for our essential mobility. In Britain today, we are fortunate to have one of the safest road networks in the world. This good fortune is not a matter of luck. It has come about through difficult and at times bitter experience. In 1931, when our Highway Code was first introduced, the we had only 2.3 million motor vehicles on our roads. But we lost over 7,000 people in traffic crashes. Today there are 38 million motor vehicles in Britain and we are losing each year just over 1,700 people. That is still far too many, and we share the determination of all the Member States participating in this debate to further reduce these figures. Our experience over many decades shows that there is nothing inevitable about rising levels of road casualties, but that improving road safety requires action on all fronts. We need safer roads, safer vehicles and safer road users. We came to recognize the combined benefits of all three areas painfully slowly. Our early attempts to educate drivers to be safer were not effective until we backed them up with strong enforcement; similarly, the design of our roads has been made much safer through advanced engineering, and the safety of vehicles has been dramatically improved by the fitment of life-saving technologies, like seat belts, air bags and electronic stability control. All countries can benefit from adopting a similar integrated approach, but adapted to their own traffic conditions and the profile of injuries. A powerful example has been Britain’s successful experience with seat belts. They were first required to be fitted in cars in 1967 but wearing rates remained low. Educational campaigns were launched in the 1970s to encourage seat belt use and raised rates to about 40%. Then in the early 1980s, as a result of a cross-party initiative by Members of Parliament, wearing seat belts became compulsory. And I am delighted that joining the UK delegation here today is one of the MPs that led this life saving campaign, Mr Barry Sheerman MP. Today Britain’s seat belt wearing is above 94% and tens of thousands of lives have been saved. Britain still faces the challenge of how to further reduce the toll. In 2015 the UK Department of Transport released a new road safety strategy entitled ‘Working Together to Build a Safer Road System’. This statement sets out the Government’s vision, values and priorities for improving the safety of Britain’s roads. Recent initiatives flowing from this strategy are policies to encourage cycling and walking to reduce car dependency, and investment in the future deployment of autonomous vehicles. One important aspect of Britain’s road safety policy is our international engagement, especially through the United Nations. We actively supports the work of the UN World Forum for Harmonisation of Vehicle Regulations and the Global Forum for Road Traffic Safety, both hosted by the UNECE in Geneva. It is vital that more countries adhere to the UN’s road safety norms and standards and we commend the efforts being made by the UN Secretary General’s Special Envoy for Road Safety, Mr Jean Todt, to encourage more governments to become contracting parties. Our Government’s Department for International Development (DFID) is also active in road safety, serving as a donor to the World Bank’s Global Road Safety Facility which is currently chaired by a senior DFID official. It would be highly desirable to establish very close cooperation between the Facility and the newly proposed UN Road Safety Trust Fund. Britain has also been a dynamic contributor to global road safety through the efforts of its independent charitable sector. In 2001 the FIA Foundation was registered as a UK charity with a permanent endowment of $300 million. Since then the Foundation has supported some very powerful initiatives. Which include: The Commission for Global Road Safety, chaired by Lord Robertson, which led the call for a UN Decade of Action and for the inclusion of road safety in the Sustainable Development Goals; The World Bank’s Global Road Safety Facility which serves as a donor coordination mechanism for the road safety activities of the multilateral development banks; The Global New Car Assessment Programme, which provides a platform for co-operation among consumer crash test and rating systems worldwide; and the Global Initiative for Child Health & Mobility, which is an innovative coalition promoting the objective of safe and healthy journeys to school for all children by 2030. I am very familiar with these initiatives because the FIA Foundation, the World Bank Facility, and Global NCAP have all been recipients of my International Road Safety Awards. Thirty years ago, I was pleased to launch the Awards to recognize outstanding achievement in road injury prevention. I feel there is a need to shine a spotlight on our road safety successes, to act as an incentive to others. The need for effective road injury prevention has never been more pressing. I would also like to highlight the work of another UK charity, the Towards Zero Foundation, on which I serve as patron. The Foundation hosts the Global Network for Road Safety Legislators which was launched in London in 2016. The Network encourages exchange of best practice in road safety policies and laws among parliamentarians. And I am delighted that Barry Sheerman MP is leading a high level delegation of fourteen MPs from eleven countries to this General Assembly debate and for a meeting later today of the UN Road Safety Collaboration. Finally, I would like to welcome the offer by the Government of Sweden to host a Third High Level Global Ministerial Meeting on Road Safety. This important event will mark the end of the UN Decade of Action, but will also lead to a new level of global commitment to road injury prevention. The Decade of Action was launched with the aim to “stabilize and then reduce” the level of road fatalities. At best today we can say that there has been some stabilization but not yet significant reduction. And we know that the SDG target to halve road deaths and injuries by 2020 will not be met. So now is the time to redouble our efforts and use the last two years of the UN Decade to set a new path of road safety progress for 2030.